Dinosaur Isle Museum curator, Dr Martin Munt and chair of the Friends of Dinosaur Isle, Dr Jeremy Lockwood, travelled to Japan to install the precious cargo and took part in the exhibition’s opening ceremony. 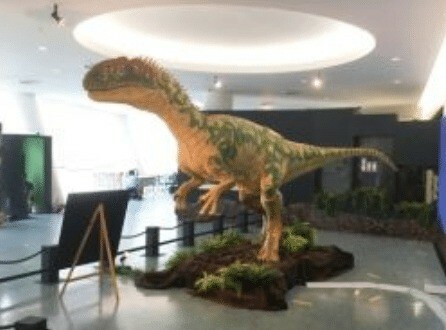 “It is a real privilege to have been invited to Japan, to one of the world’s leading dinosaur museums. The museum is a wonderful collection of dinosaurs from around the globe, and it is genuine reflection of the global importance of our collection here on the Island that our fossils are the most prominent part of the exhibition,” said Dr Martin Munt. “It is great that Neovenator is the real star of the exhibition among many wonderful fossils from around the world. It is a terrific opportunity for Dinosaur Isle Museum to extend its partnerships and given us the chance to discuss future collaborations.